As IT trends change the way organizations traditionally manage their business, Dell is at the forefront of helping customers address any challenges and deliver real value to businesses with our end-to-end IT solutions and services. Dell hopes to do this through four key themes, Transform, Connect, Inform and Protect. 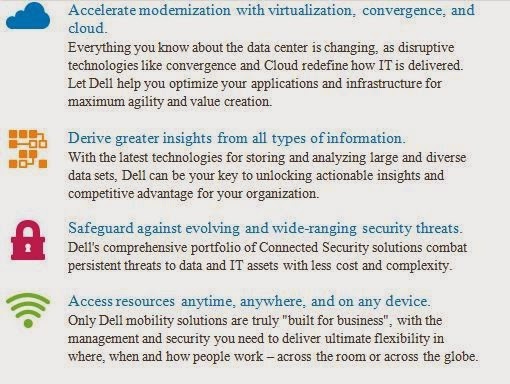 Dell believes that it can help customers improve their IT agility through transformation in the data center; increase productivity by enabling the next generation workforce to connect securely to the corporate data anywhere, anytime and on any device; gain control of the data deluge and use this information to gain competitive advantage; and protect their organization from external or internal IT security threats. These themes will become even more relevant in 2014 as firm encounter impact change and challengers from cloud computing, BYOD, social media, big data analytics and security. The Dell Solutions Tour gave insightful discussions on breakthrough solutions. Dell Solutions Tour brought together IT professionals to address key issues, IT professionals were there to share information on how they overcame technology challenges with the help of Dell.